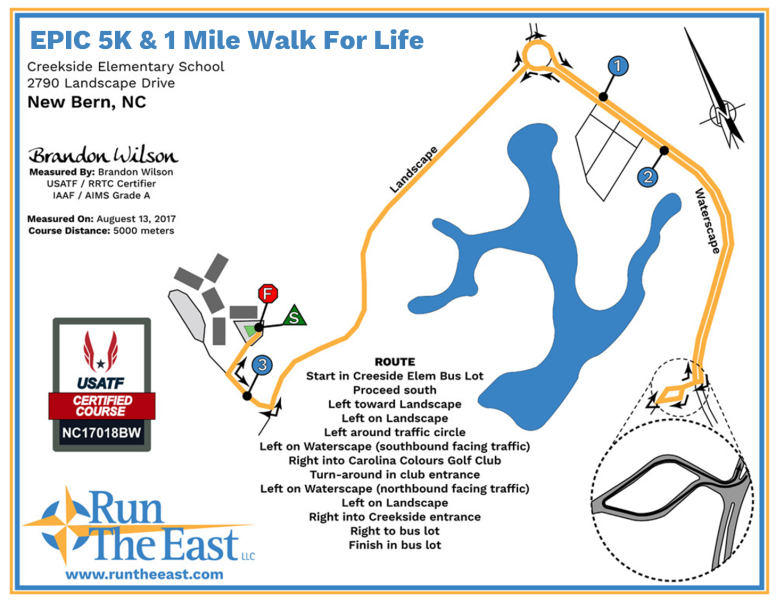 Register for the EPIC 5K & 1 Mile Walk for Life (New Bern) today! Ask everyone you know to sponsor you! Your sponsors have the option to let you collect their money, pledge online right here on this site by clicking the 'DONATE NOW' tab in the upper right-hand corner (they will have to fill out their own info AND state YOUR name--the name of the person they are sponsoring), or be billed by the center. Bring your completed pledge form(s) & any monies collected on race day. Walk up to the 'WALKERS' side of the registration table and let them know you're submitting your sponsorship pledge form. Bring the whole family--RAIN or SHINE and get ready to walk your mile in support of what we do here at the EPIC Center! Thank you in advance for your time and effort, and may the best man, woman, or child win! Second Place: Large Gift Bag filled with yummy practical goodies! The run will begin and end at the Creekside Elementary Bus Lot and take you through the main thoroughfare into the beautiful Carolina Colours sub-division.